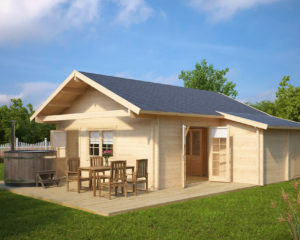 Our range of residential log cabins is among the best you can find in Spain. 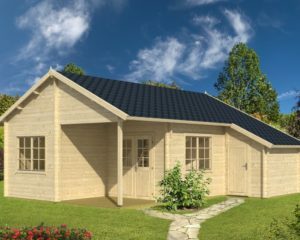 We have studio type log cabins with a separate washing room as well as one, two, and even three-bedroom residential log cabins. 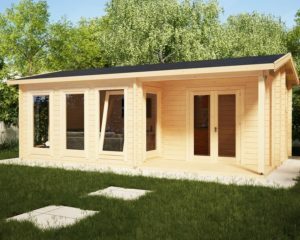 Our installation team can install any of them within a week. 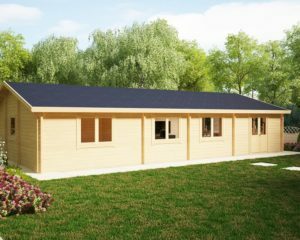 Our range of residential buildings are affordable and very long lasting. 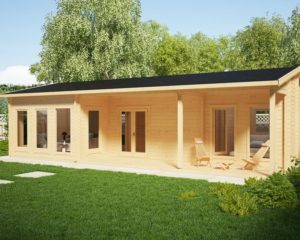 They are widely used as extensions to existing homes, holiday homes, holiday rentals, guest houses, office buildings and even houses to live in. 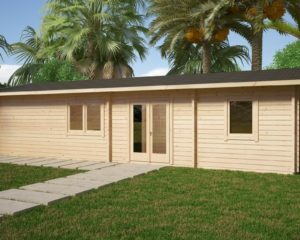 Additionally, you will get that cozy natural feeling and fabulous smell, when inside that only wood can offer. 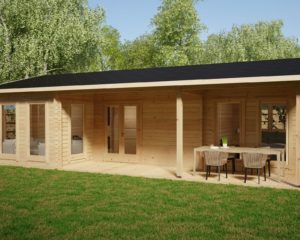 Our residential log cabins come with 58mm, 70mm and 92mm prefabricated interlocking wall planks. 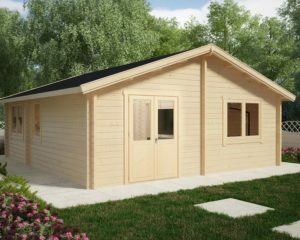 For some smaller cabins up to 20-30m2, we use 58mm thick wall planks, the majority with 70mm and finally a few residential cabins with very large halls and rooms with 92mm thick wall planks. 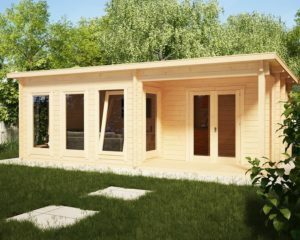 Double tongue and groove planks increase stability and make walls absolutely wind proof. 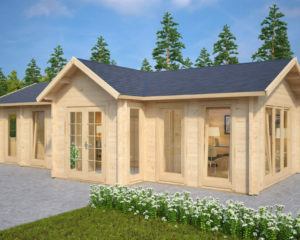 All residential cabins have double glazed windows and doors. We use German made Roto handles and locks for doors and Roto “Turn and Tilt” systems for windows. This ensures the best possible functionality, security and very good durability. 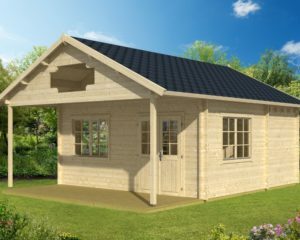 All residential cabins have 28mm tongue and groove floor boards, 18mm roof boards and impregnated foundation planks. Buildings with terraces have 28mm impregnated terrace boards included in the standard set. All cabins have strengthening metal rods included. These rods are inserted in to predrilled holes in several wall parts to offer extra stability. Additionally, we also include metal storm braces in all cabin sets. They are inserted throughout the entire wall in four corners and fixed with nuts. 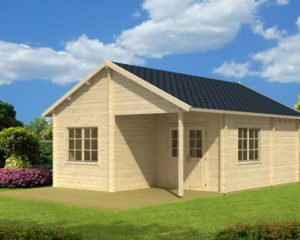 And finally, all the remaining wooden components like roof beams, boards and pelmets as well as bitumen roofing felt, all screws, nails and other fixings to build up a cabin, are all included in the standard cabin set. 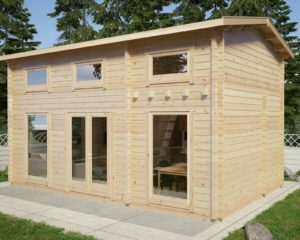 All wooden buildings must be treated with wood preservative or paint as soon as installation has been completed. 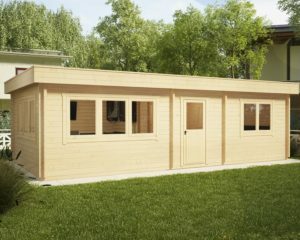 This will prevent wood from rotting and protect it from UV light and becoming grayish. Paints or preservatives can be bought from your nearest home improvement store or construction market. All you have to know is the required area (m2) to be coated in order to buy the required amount of paint or preservatives. Alternatively, you can order top quality “Remmers” wood preservatives from our online store for an extra fee and have them delivered together with your cabin. 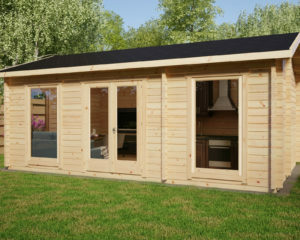 Please be aware that applying wood preservative to your cabin is not included in the installation price. 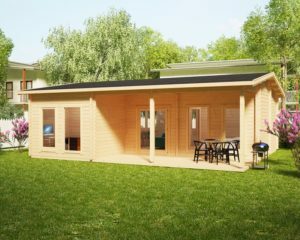 Thermal-insulating materials are not included in the cabin set. Whether you are going to insulate your building or not, it is best to decide this before you start the installation. This is especially important for floor insulation, because it is laid beneath the floor boards. 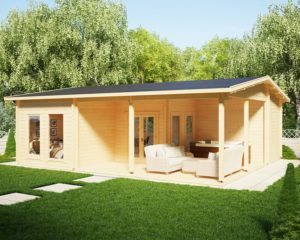 We would strongly recommend insulation in cabins that are to be used all year-round. Two areas that require insulation are the floor and roof. 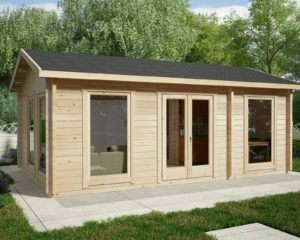 This will keep your cabin warmer over the colder months and cooler in summer months. 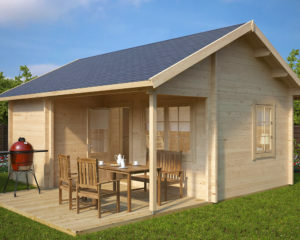 The cost of insulation not normally more than 10% of the cabin price. 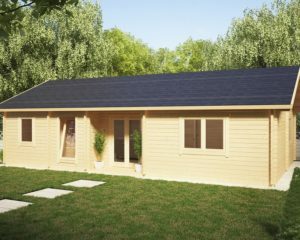 Black bitumen roofing felt is included in the standard price of all our residential cabins and even garden rooms. It works well as a temporary cover for few years and is a perfect underlay for a higher grade roofing material such as shingles or metal sheets. 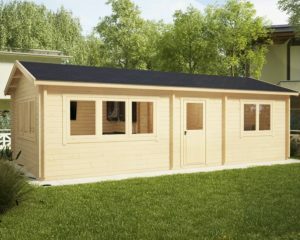 To offer the best protection and upgrade the exterior look of your cabin we recommend a metal roof or roofing shingles. We offer Finnish made Icopal bitumen roofing shingles for apex roofs and self-adhesive Fire-Smart roofing felt for pent roofs for an additional cost. These products have a 15 year factory guarantee. 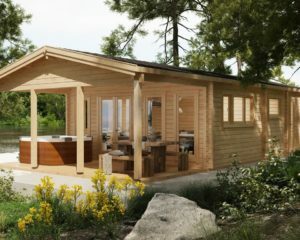 Cabin installation is not included in the product page. 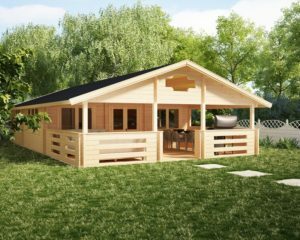 With proper DIY skills you can build your log cabin yourself. You need tools and one pair of hands to assist you. 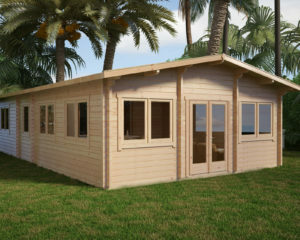 Or you can hire a local carpenter or order your cabin with our professional installation services.